is a university lecturer and independent researcher in sociology. Her most recent book is Authors of our own Misfortune? The Problems with Psychogenic Explanations (2012). She lives in London. The belief that physical illness can be psychosomatic, or caused by the mind, has long been seductive, capturing the imagination of doctors and writers alike. Such diagnoses inform the medical texts left by the Tudors’ physicians in 16th-century England, as well as Molière’s Le Malade imaginaire (1673), and the often-titillating descriptions of ‘hysteria’ generated by the French neurologist Jean-Martin Charcot and his colleagues at the Salpêtrière hospital in 19th-century Paris, not to mention the 20th century writings of Sigmund Freud, once a student of Charcot. Literary characters made sick by their thoughts inhabit the gothic, aesthetic genres of authors such as Henry James, whose sister Alice was deemed ‘hysterical’. Contemporary, ad hoc resurrections of the concept of hysteria, now called conversion disorder, are commonly diagnosed by doctors and accepted by patients, for instance, the novelist Siri Hustvedt, who described how her psychological stress manifested in profoundly disabling physical ways in the memoir The Shaking Woman (2010). It might seem counter-intuitive to adopt a skeptical position against such culturally and medically entrenched ideas. But my research suggests that psychogenic explanations for physical conditions can be dangerous. They contain numerous confused ideas, flaws in reasoning, and fundamental problems in methodology, often making a mockery of claims to be ‘scientific’. Such explanations constitute a ‘God of the gaps’ theory, whereby fictional, sometimes magical narratives slip into medical reasoning whenever there is a vacuum of knowledge. They contain prejudicial assumptions about people and how they experience their ill-health. Yet the assertion that physical illness is due to psychosocial stress is absurdly common, in both the popular media and the medical literature. Here are some illnesses that are so described: high blood pressure; skin complaints; migraine; menstrual disorders; cancers; multiple sclerosis; leprosy; Lyme disease; myalgic encephalomyelitis; Parkinson’s disease; diabetes; headaches; migraine; stomach aches; reproduction and growth problems; gastrointestinal dysfunction; immune problems; fatigue; hypothyroidism; cardiovascular disease; flu and the common cold. The abundance of conditions supposedly caused by psychosocial stress is enough to raise alarm bells in a critical, scientific enquirer. One logical flaw in such reasoning is that stressful life events and circumstances are themselves ubiquitous. The British psychiatrist Eliot Slater understood this in 1965, when he said that: ‘Unfortunately we have to recognise that trouble, discord, anxiety and frustration are so prevalent at all stages of life, that their mere occurrence near to the time of onset of an illness does not mean very much.’ Even positive life events or conditions can be stressful. What’s more, memories of stressful events can be unreliable, especially if the recounting of such self-reported events is influenced by the expectations of researchers. Individuals or families who have suffered from an illness with uncertain or mysterious causes may be more likely to imagine a causal link with adverse life events. A study in 1960, for example, found that parents of children with Down’s syndrome reported more ‘shocks’ during pregnancy than control subjects did. However, Down’s is a genetic disease that occurs at conception (though at the time of the study this had not yet been discovered). Ironically, ‘healthy’ control subjects might tend to under-report adverse life experiences, and over-estimate their ability to control their circumstances. Sick people, on the other hand, are more likely to report adverse events, which are then incorrectly assumed by researchers to be directly relevant to the illness itself. 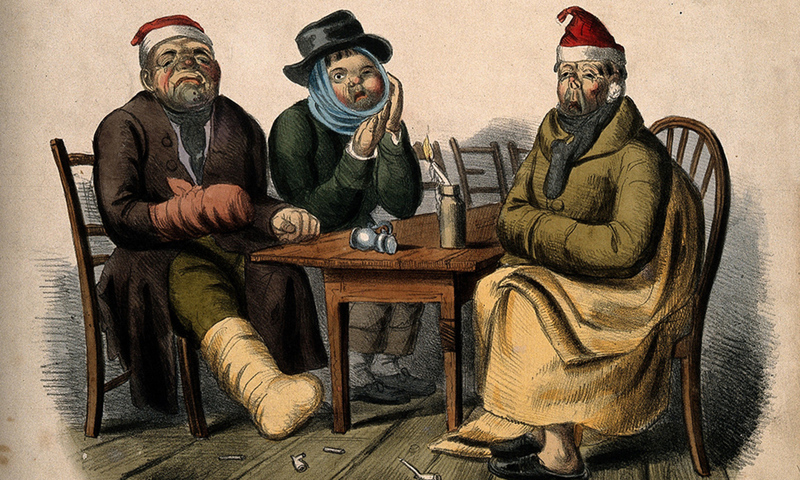 Conflating psychological adversity with illness is now the topic of many books, including Childhood Disrupted (2015) by Donna Jackson Nakazawa, excerpted in Aeon. Specifically, Nakazawa reports on survivors of childhood adversity, the group followed by the United States Centers for Disease Control and Prevention and its partners in their massive, long-term Adverse Childhood Experiences study. The study might have good intentions, but is subject to the same problems of confounding, and is as likely to be used in victim-blaming. The tendency to accept without question the vague mechanisms by which the mind allegedly manufactures disease is reflected in the very language we use to describe the process: switches, black boxes and hypothalamic-pituitary-adrenal axes are but a few. These terms mean little. Elucidated, verified physiological mechanisms of psychosocial stress, specifically causing illnesses – from cancer to the common cold – remain, at this stage of scientific inquiry, absent. One pernicious version of this argument is that certain ‘personality types’ might be at higher risk of developing certain illnesses, for example the ‘Type A personality’ is deemed more likely to suffer cardiovascular disease. But correlations between this subjectively derived personality type and cardiovascular conditions are weak. Recently, additional personality types have been claimed as precipitating cardiovascular dysfunction, including the ‘Type D’ or ‘distressed’ personality. This indicates that any response by a sick person subjectively deemed ‘negative’ by others risks being considered pathological and causing illness. Yet another type, proposed as influencing breast cancer, is the ‘conflict‑avoidance personality’. Non-competitive and easygoing women, who are in harmonious personal relationships, are assigned this category. Women with breast cancer who are ‘uncooperative and feisty’ are claimed to survive longer than ‘well-behaved’ and ‘passive’ patients. Taking these assumptions to their logical extreme, no sooner will the ‘Type A personality’ woman be supposedly safe from breast cancer than she’ll be killed by cardiovascular disease. In addition to psychogenic dismissal – where physical ill‑health is left un-investigated and untreated – psychogenic explanations effectively pathologise a patient’s personality and encourage patients to self-blame. This raises serious ethical problems. Is it right, for example, to tell women that whether they survive breast cancer or die from it relies on arguing less and talking more, or changing their ‘personality’, when such ideas are not substantiated? In the same way, should women and men with cardiovascular disease, deemed to be ‘Type A’ or even ‘Type D’ (worried) personalities, suffer even greater adverse psychosocial stress by being made to believe that those personalities have damaged their health? Despite the seductiveness of psychogenic explanations for physical ill-health, the oft-expressed idea that ‘our thoughts make us sick’ is not supported by the available evidence. It is riddled with fallacies in reasoning, and causes harm to those to whom it is applied.